We just can't do the holiday without coming up with a stamp set just for tags! One of the many joys of the holidays is giving, and we like to make sure that giving is pretty! It's always fun designing stamps for gift tags, something about smaller images and sentiments, it is just always cuter! These smaller sentiments fit perfectly in the new Winter Taggins die set we are releasing this month as well! How about a little video showing how these came together? Love these sweet little tags! Especially love the snowflake for Christmas! This is so cute!!! Love the tag designs and oh that snowman!! 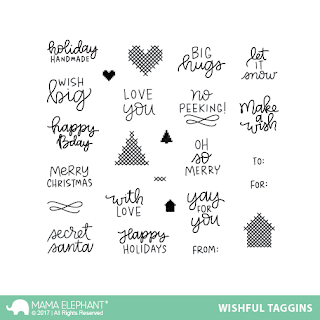 Love the wishful taggins so cute! What fun tags and stamps! I need these! This are so sweet! Love the videos too! These are soooo cute! Love them all! Those are adorable and would be a great add to my collection! I love that you can layer the tags. Cute sentiments. These are so adorable and are going on my list! These little tags are so cute and versatile! These are tiny treasures :) Beautiful!! Oh wow! These are so adorable! Oh my goodness !! These are the cutest tags ever !! Oh those are so pretty.